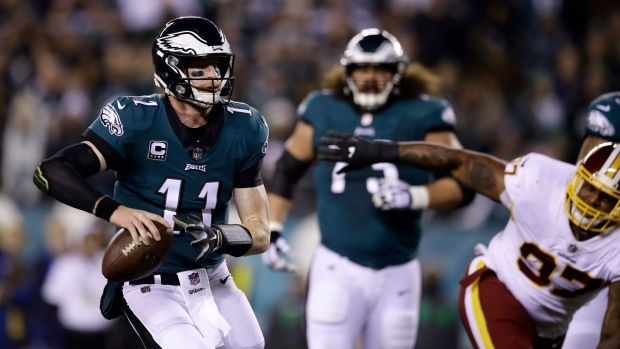 PHILADELPHIA — Carson Wentz was at his best back on the move again. Adrian Peterson ran 90 yards for a touchdown on Sanchez's first play under centre, giving the Redskins a 10-7 lead. It was the longest run Philadelphia has allowed in franchise history but Washington's lead didn't last long. "Anytime he can extend plays with his legs, he's such a great athlete, that's an advantage to the offence," coach Doug Pederson said. "Being able to do that allows us to stay on the field. He's gifted in doing that. It comes natural to him." "I'm really happy for him," centre Jason Kelce said. "I don't usually know who is back there but when I saw it was him and he got in the end zone, I had a big sense of joy. He's a phenomenal guy."